Hear your little on roar in this toddler lion deluxe costume! 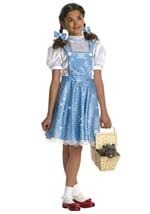 A cute and fun Cowardly Lion costume, this costume includes a fleece jumpsuit made from polyester. The jumpsuit zips in the back and also snaps along the interior of the leg for easy on and off. Wire lines the tail attached to the back and allows you to shape it how you like. A red ribbon is also tied to the tail. Mitts are attached to the arms and covered with faux fur. Matching lion slippers have paws on the bottom. The lion headpiece has a large opening for the face is surrounded by a faux fur mane. It snaps in the back to secure it in place. Show everyone your tike has courage with our badge of courage accessory!